Ever wish your walls could talk? With infrared thermography, they practically can. See grouted cells, insulation, and air leakage in an entire wall section to ensure they are strong and efficient. This non-invasive method lets you find out what's going on with your walls before, during, and after construction. Infrared imaging of your CMU (concrete masonry unit) block wall is accurate, non-destructive and inexpensive. This is the best way to see the grouted cells, insulation and air-leakage in the entire wall section. Infrared tresting can be performed at any time during the construction process without delaying or interrupting any other trades or affecting the progress of the building. You might think the only way that one can know whether the grouted cells, bond beams, insulation and other components of a block wall are properly placed, is to open it up with hammer or drill, where the grout or insulation is supposed to be and see if it is there. However, this method of testing is destructive and inadequate as the small holes do not show where blockages and/or too much grout exists. This also makes it expensive since you have no conclusive results and a bunch of holes to fill in. Two major benefits arise from having a BlockWallScanIR infrared test performed on your newly constructed CMU walls. When deficiencies are found, a report can be generated so that corrections can be made with surgical precision. The owner gets what he paid for and designers can literally “see” that their specifications have been followed. 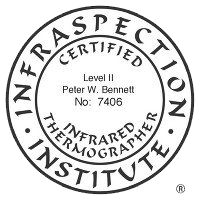 NJInfrared.com is a member in good-standing of the United Infrared Network, which is the largest network of multi-disciplined infrared thermographers in the world. As a member, we receive support for our customers from industry experts with decades of combined experience.